A solid foundation and scalable infrastructure to support revenue growth. With your growth and performance goals top of mind, we design, implement and enhance your marketing and sales infrastructure with the strategy brand, creative, technology, reporting and analytics assets you need to transform the way your company generates revenue. Brand development, analysis and updates. Unique value proposition and messaging architecture. Integrated marketing and sales technology stack. Predictive marketing and sales technology. Online strategy, including website and social media. Sales collateral and marketing support materials. Revenue growth strategy and execution plan. 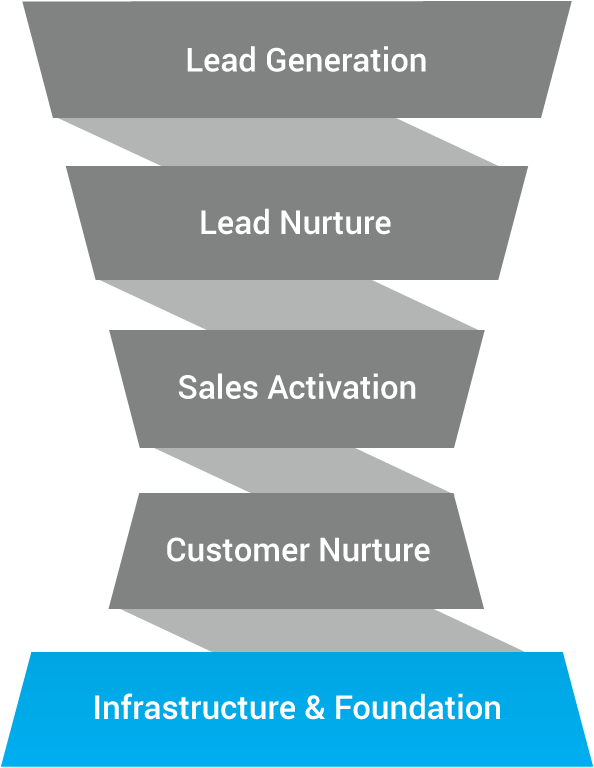 Lead nurture and management processes. Data enhancement and data hygiene. Internal systems for stakeholder communications and alignment. Companies’ inability to align sales and marketing teams around the right processes and technologies has cost them 10% or more of revenue per year. Infrastructure solutions from BIG IDEA. BIG IDEA collaborates and consults with you to create an overarching strategy and architecture that helps ensure your marketing, sales, and technology solutions are aligned and focused on meeting your immediate and ongoing revenue and business growth goals. Integrated expertise and execution. Aligned with your goals. BIG IDEA’s team of creative, technical, client services, and strategy personnel, work collaboratively with your team to make sure the strategies, tactics, creative content, and other marketing and sales solutions that we produce stay synchronized and measured for optimization, all aimed to make your demand generation, sales activation, and revenue growth program succeed. Brand, brand standards, and unique value proposition. Target audience’s needs, wants, desires, concerns, and drivers – both logical and emotional. We uncover and validate these insights in a number of ways, including: surveys, interviews, in-market testing, and focus groups. Predictive analytics insights and customer base segmentation. Your target audience’s buying journey, including all market segments and key buyer traits. Lead management and nurture processes. Integrated demand generation and sales activation strategy (top, middle and bottom of marketing and sales funnel, across all channels). Technical applications, including: marketing automation, CRM, multi-channel lead generation, CMS, web analytics, and other relevant technologies. Program timeline, and budget and resource realities. Predictive insights. Driving strategy and success. We accomplish this by leveraging insights gained during the market discovery and assessment, and predictive modeling and analysis stages. Insights gained here guide strategy and tactics that boost ROI and grow your revenues. Agency Services. Supporting your revenue growth and company goals. Marketing and sales integrated revenue growth strategy, solution plan and program/campaign design. Predictive Marketing and Sales technology revenue consulting, framework development, and implementation. Multi-channel media solutions including PPC, SEM, SEO, Email, Telemarketing, CPA, Affiliate Programs, Social Media, and Special Events. Technology solutions, consulting, development, integration and configuration services including: marketing automation, CRM, CMS platforms, business intelligence platforms, campaign testing and optimization, and other related technology services. Reporting, tracking, attribution and analytics services and consulting including detailed insights and recommendations. Program, campaign and content optimization consulting and recommendations. Project, program, campaign, and account management. Creative and content development services including: brand development/evolution, creative strategy, messaging, copywriting, graphic design, video, animation and illustration, and photography.